Details TBD. Wine tasting in Magnolia Village. Purchase bottles tax-free! Member & non-member ticket prices TBD. Become a member anytime! Tickets available in June. Menu includes spaghetti (meat and vegetarian), salad, bread, dessert and beverages. Saturday 4-7 pm. 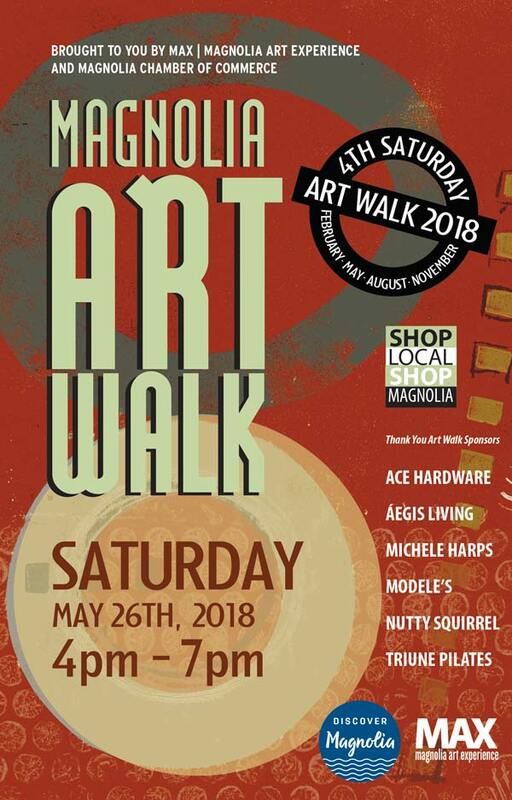 MAX & Chamber of Commerce Spring 2019 Art Walk. 8/2-8/4. Schedule TBA. Magnolia's annual megafest: music, crafts, parades, jumpy-houses, and free fun for kids. Tentative dates: Start 9/11. 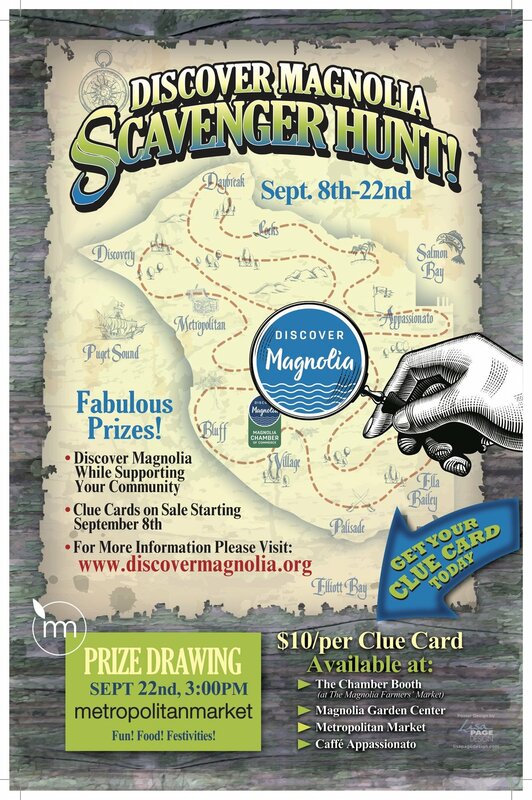 Discover special locations in Magnolia, fill out the Clue Card, and your card for a raffle ticket at the 9/21 raffle drawing & celebration. Tentative date & details. Oktoberfest beers, brats and Bavarian music. Join the planning committee! Saturday 4-7 pm. MAX & Chamber of Commerce Fall 2019 Art Walk. What will make 2019 Trick-or-Treat the BEST? Contact us if you are interested in sponsoring or helping plan something new! Tentative date & times. 2-5 family fun & 5-8 merchant holiday open house. Don’t miss Santa photos at Windemere & Tree Lighting at Magnolia Garden Center. Not-for-Profit Expo: Networking for not-for-profit organizations, community members and businesses. Bring food for the Ballard Food Bank. Children are welcome. Food will be available on-site, specifics TBD. Taste of… event. Tickets available soon with member & non-member prices. Aegis Living Queen Anne at Rodgers Park hosts a food and wine tasting tour. Food & drink provided by Magnolia Chamber members. Wine tasting in Magnolia Village. Special offers: Purchase bottles tax-free. Buy online & save $5. Become a member & receive a FREE ticket… plus the $10 member discount on additional tickets. Saturday 4-7 pm. MAX & Chamber of Commerce Winter 2019 Art Walk, January 26th. Dinner celebration of 2018 successes and Person of the Year, nominated & selected by the community. Thank you to Chinook’s Salmon Bay for hosting! Vote by December 19th for 2018 Person of the Year. All community members are invited to vote by email to info@discovermagnolia.org. Magnolia Royale ticket sales have ended. Annual McGraw trick-or-treat with the exact correct amount of mayhem! Show off your costumes then catch dinner or dessert before Magnolia Sugar Crash 2018! Tag us in Facebook & Instagram posts for a digital neighborhood fashion show! @DiscoverMagnolia / #MagnoliaToT2018 and toss in some throwback pics with #MagnoliaToT____! October 18th: Deadline to raise almost $11,000! Consider teaming up to sponsor a tree for $150. Donate any amount online, in-person, or by mail. See the full event page for details. Use clues to discover spots around Magnolia. Fill out the Clue Card with details you find then be present on September 22nd at Metropolitan Market to have your card entered into a raffle to win fabulous prizes! Clue cards ($10 ea) are available at the Chamber booth at the Farmers Market (Saturdays 10-2), the Magnolia Garden Center, Metropolitan Market and Caffe Appassionato. Caffe Appassionato - Coffee for a year! Come celebrate the new mural found in the Magnolia Village on Saturday, September 8th 10am-2pm. Join us during our monthly public meeting where we will be discussing our annual Summerfest event and upcoming workshops for small businesses.